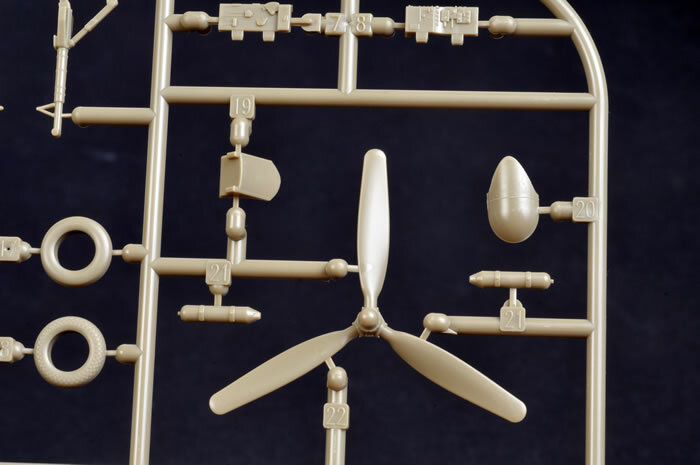 Advantages: New wing sprues means no filling or scribing for the -5; superb detail; excellent surface texture (combination of recessed panel lines, lapped fuselage panels and fabric control surfaces); straightforward parts breakdown; ample options including centreline fuel tank, bombs and three styles of engine cowling; excellent clear parts with different sliding sections for open and closed options; perfect moulding; excellent quality decals. Disadvantages: Side opening box; all plastic parts packed into one bag. 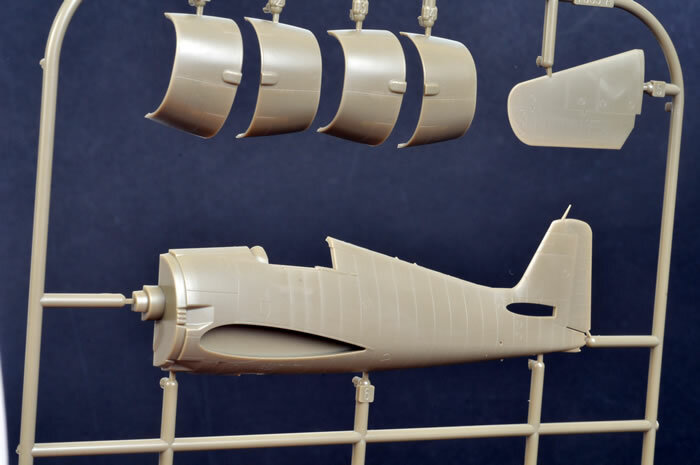 A number of 1/72 scale F6F kits have been available for some time now. 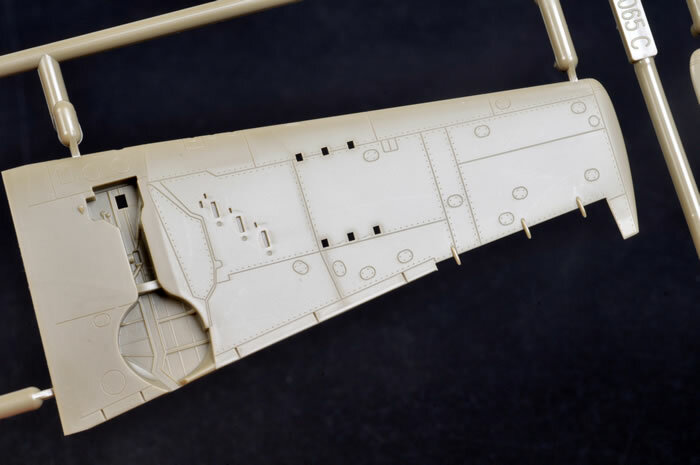 Hasegawa's is an older kit with raised panel lines and a basic cockpit; while the Academy 1/72 scale Hellcat has thick trailing edges, an incorrectly shaped fin and sparse detail. 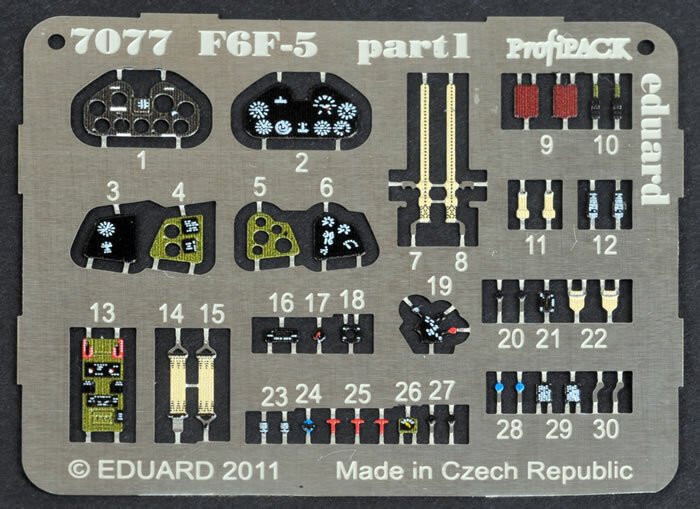 Eduard entered the Hellcat market with their 1/48 scale F6F-3 kit, first released in early 2008, and followed by an F6F-5, -5N and Hellcat Mks. I and II. 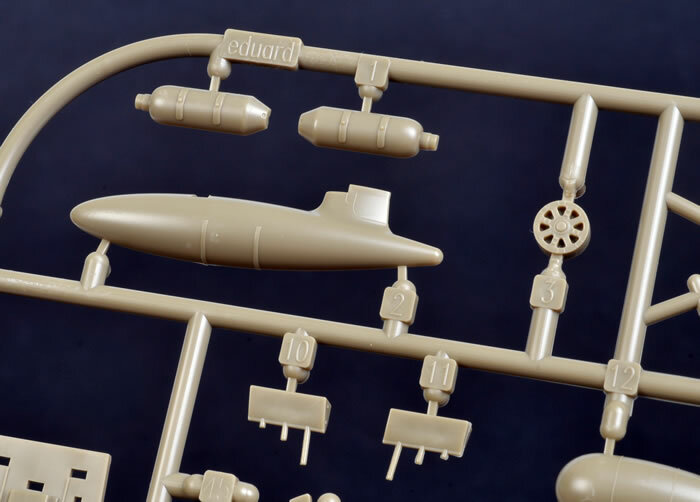 These are excellent kits - well detailed with lots of options and state-of-the-art surface detail. Eduard then released a 1/72 scale version of their F6F-3 Hellcat in August 2011. 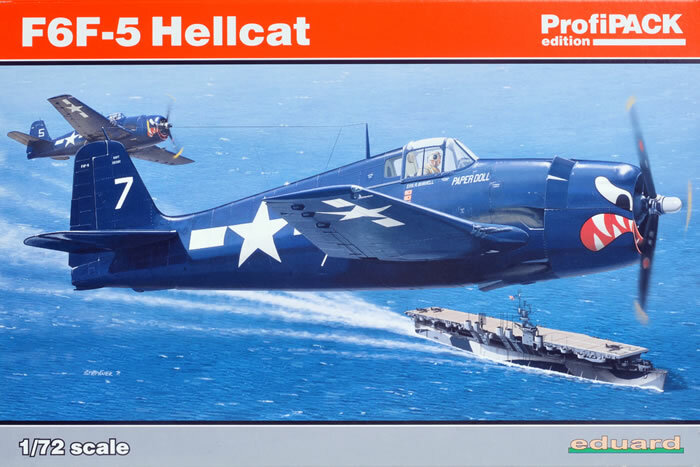 The latest in this small scale Hellcat family is the F6F-5. 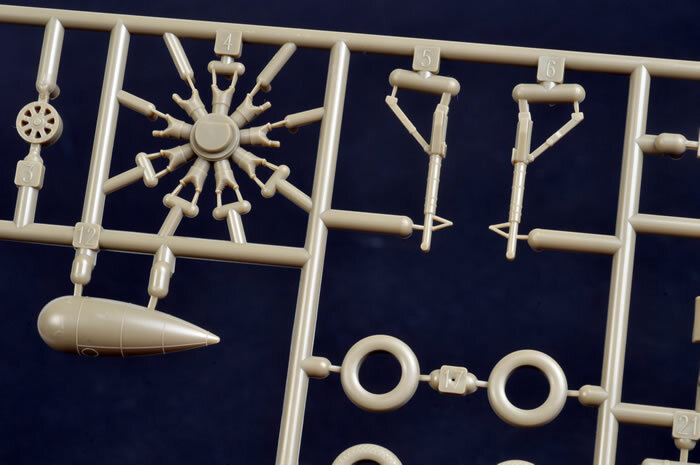 The first point to make is that the F6F-5 kit features a specific new wing sprue, so filling or sanding will be required to obtain this later variant. Otherwise, apart from revised photo-etch, decals and the box, contents are the same as the excellent F6F-3. 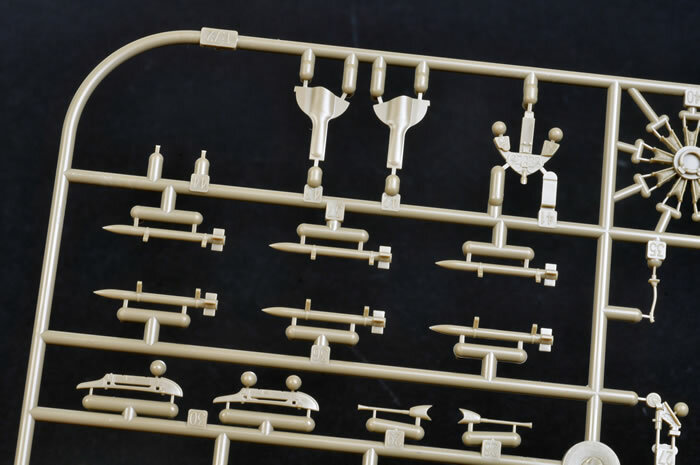 The kit comprises comprises a total of 68 parts in olive coloured plastic; 8 clear parts; one nickel plated photo etched frets; one coloured photo etched fret; a masking sheet for the canopy and wheels; and a large decal sheet covering five markings options. Surface texture on Eduard's latest releases has been superb, and this new Hellcat continues the tradition. 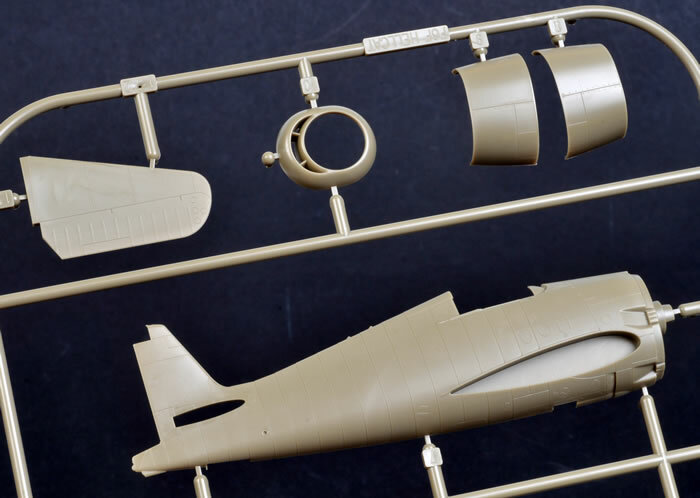 In common with its 1/48 scale cousin, this Hellcat fuselage employs a unique and subtle lapped panel effect. This really works well. The balance of surface detail is a combination of crisp, finely recessed panel lines and selected rows of rivets. The subtle ribs on the fabric control surfaces are also very convincing. 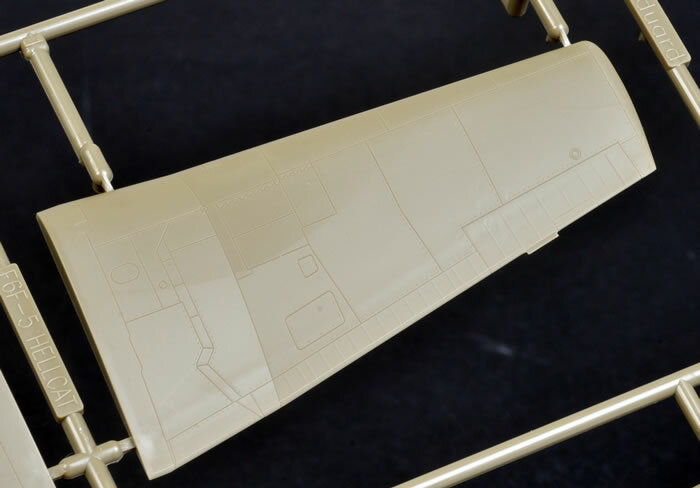 For those who prefer to paint their cockpit, an alternative (and very nicely detailed) injection moulded instrument panel is also supplied. 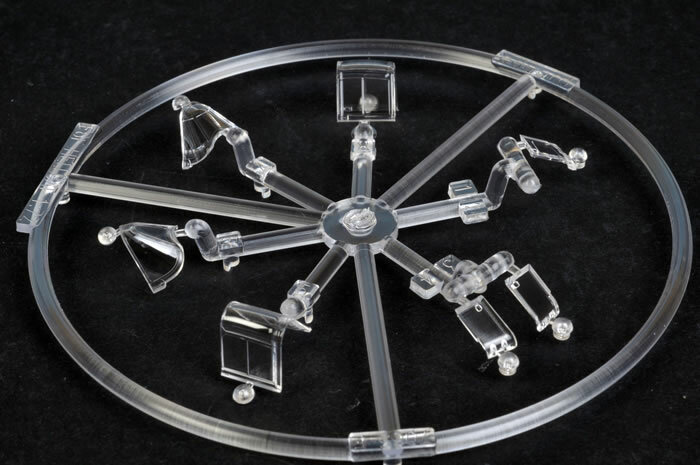 The well-detailed engine is made up from five plastic parts. Pushrods are moulded in place, a photo-etched ignition harness is added, plus several colour photo-etched parts enhance the crank case. The undercarriage legs and wheel wells are suitably busy. The wheels are supplied with separate hubs and tyres. Two styles of tyres are included - diamond and radial treads. While the tyres in the initial release of the 1/48 scale Hellcat were a little undernourished, the width of these look good. 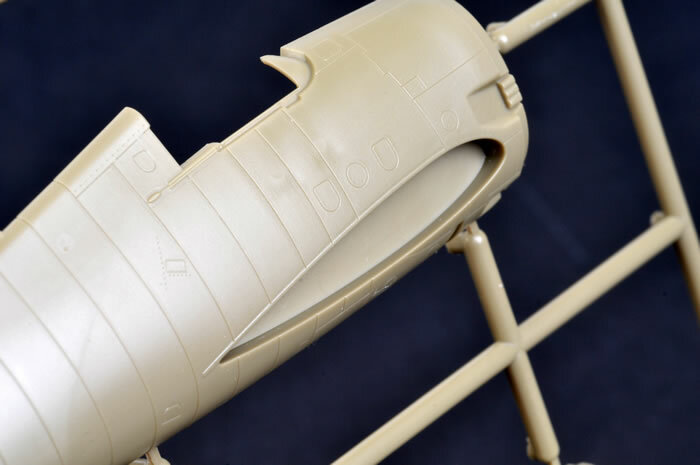 The delicate antenna post on the fin is moulded in place, so some care will be required when handling the model during construction and painting. 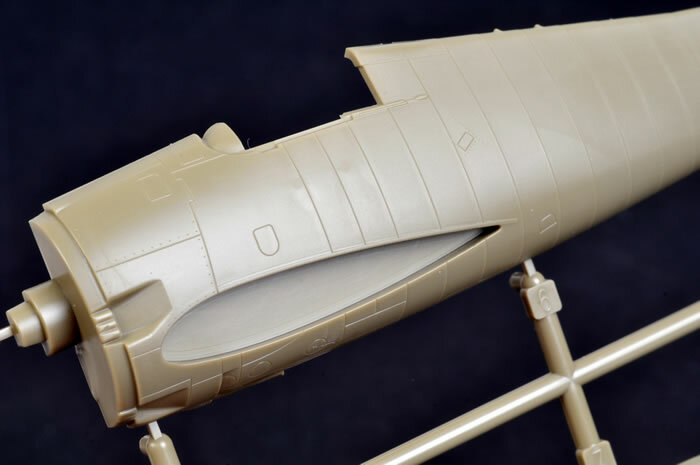 Control surfaces are all moulded in place and in neutral positions. The wings are specific to the F6F-5 variant. Three cowls are supplied, but only one is relevant for the -5. 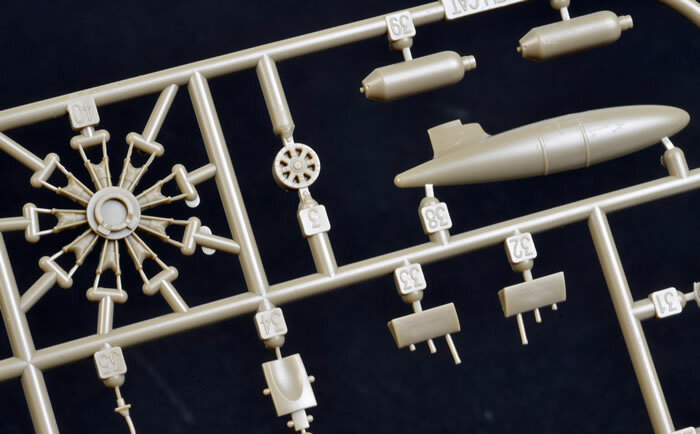 Optional parts are included for two styles of bombs, centreline drop tank and rockets (although the rockets are not used in this boxing). 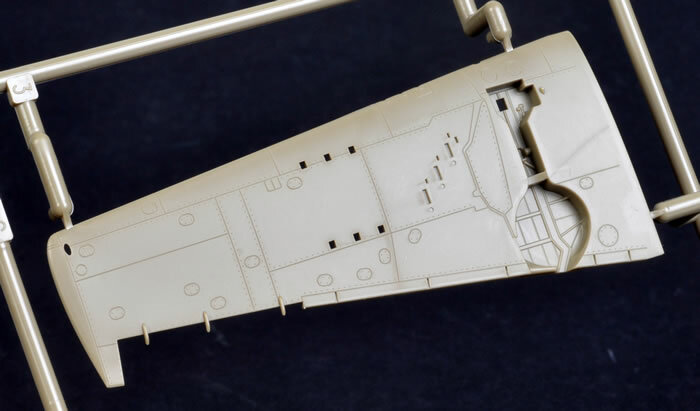 Just about the only thing I don't like is the side-opening box - flimsier than Eduard's usual top-opening box and harder to sift through the contents - and that all three olive-coloured sprues are packed into a single bag (a la Hasegawa), resulting in some minor scuffing on the fuselage parts. All four marking options are finished in overall Gloss Sea Blue. 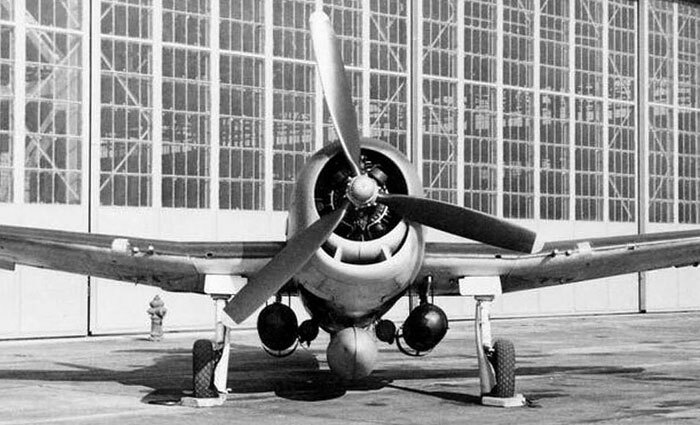 The question of the Hellcat's chin intake shape has long been the subject of lively discussion. Eduard has done a very good job at capturing the size and the subtle shape of this distinctive grin in 1/72 scale. 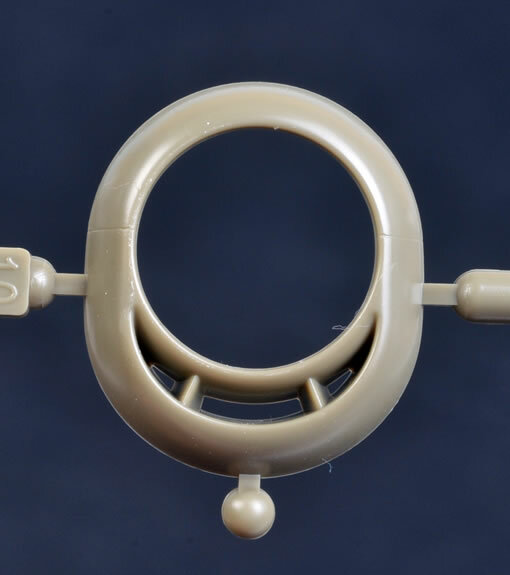 We have seen some standard setting 1/72 scale kits recently, including Dragon's recent gorgeous Gloster Meteor releases. 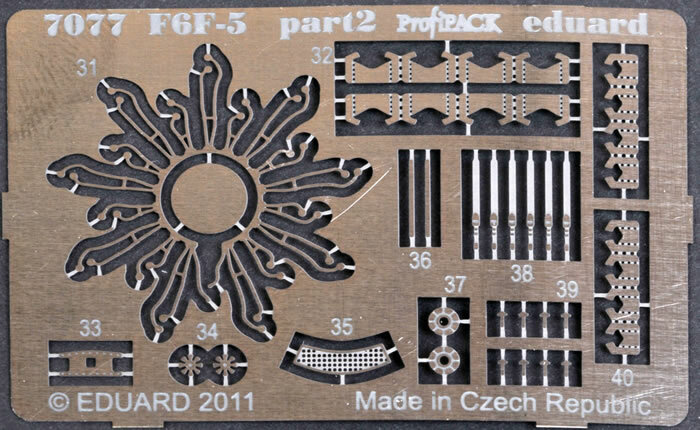 Eduard has now upped the ante with their new 1/72 scale F6F Hellcat family. The surface detail is as good as any I have ever seen in this scale. The overlapping fuselage panels are especially appropriate and beautifully executed. The addition of colour photo-etched detail parts for the cockpit and the engine crankcase are genuinely useful enhancements, especially in this scale where fine painting is more of a challenge. There are few compromises when compared to Eduard's excellent 1/48 scale F6F Hellcats. The cockpit and engine feature the same level of detail; there are actually more options with the two styles of wheels in addition to the ordnance. The main difference is that the smaller kits do not have separate control surfaces. 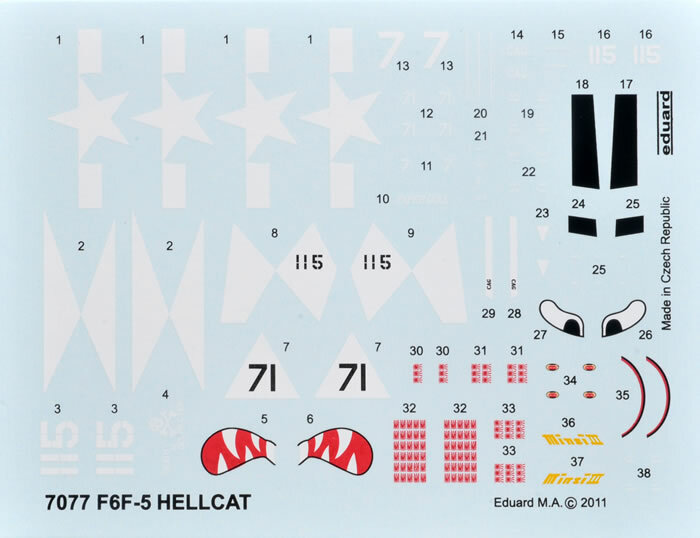 Eduard is not new to 1/72 scale kits, but their F6F Hellcat family certainly sets a new standard. This new F6F-5 kit will be warmly welcomed by US Navy aficiandos and 1/72 scale modellers alike.